I recently moved to the Kansas City, Missouri area as I’m putting my global travels briefly on pause to rejoin the working world and refill ye olde travel coffers. While I’ve slowed my pace on the international cat cafe circuit, I’m making up for it domestically by hitting up as many cafes I can within driving distance. I’m lucky that Missouri has so many fine options, including one right here in KC! 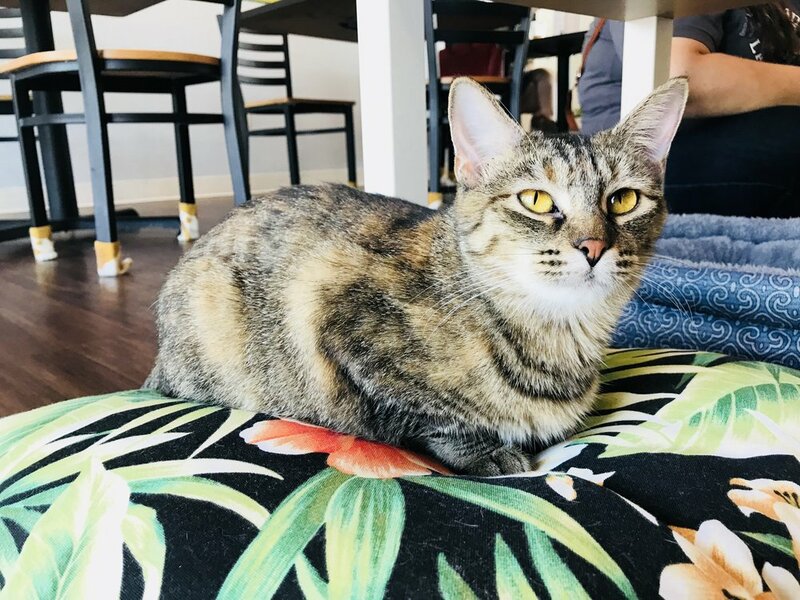 And while this was initially supposed to be a recap of Missouri cat cafes, I found a gem just across the border in Arkansas, so consider this an added bonus! I recently moved to Kansas City, but it already feels like home, in large part because of Whiskers. We landed here last summer after spending two years traveling the world. At first, I wasn’t sure how I would feel about settling down, but it turns out that my passion for cat cafes, especially those that facilitate rescue and adoption has helped me find my community. A cat cafe family of sorts, where I have found kindred spirits and fellow cat lovers all over the globe. Audrey and JT, owners of Whiskers, are two more additions to my cat cafe family. They are the ideal cat cafe people having all three characteristics needed for success- great with cats, excellent with people and adept with business- they are incredibly caring and hard working folks who deserve all the kudos! It hasn’t been an easy road. They began with a Kickstarter in July 2016, and while funding went well, finding a location proved to be most difficult- over 20 different spaces were considered before locking in our their current Midtown spot. Safe to say, it was worth the wait. The cat room is absolute perfection- with high ceilings, lots of natural light and a thoughtful, yet spare design. Throw in soft music and even softer fuzzy white rugs, and there is something so calming about Whiskers that you want to just hang out for hours. They take advantage of the room’s verticality by adding lots of elevated spaces for the cats, including a huge tree in the center of the room, based on a Lego model built by JT. Open since November, Whiskers has facilitated 41 adoptions as of March 11, 2019. They are partnered with with world-class shelter organization KC Pet Project, a group that carefully screens and selects cats to be featured at the cafe. The selection and socialization plan at Whiskers is really well done. 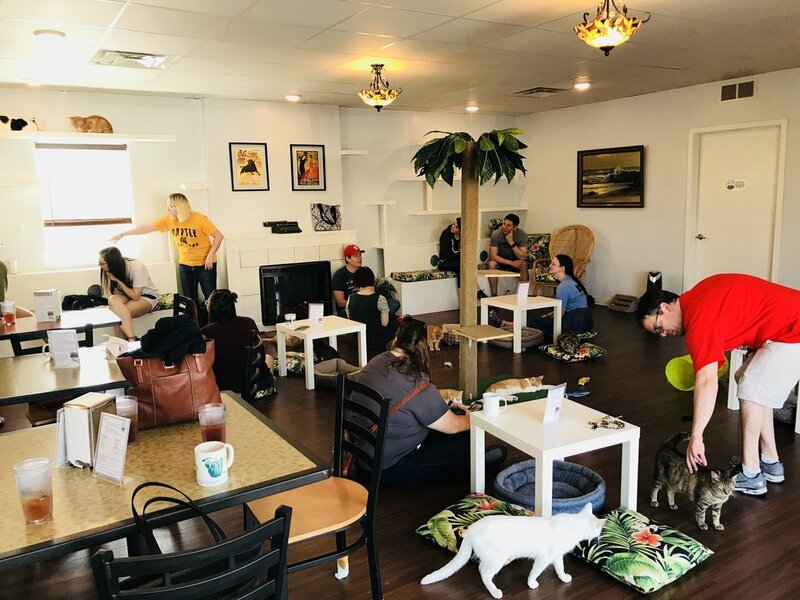 With the help of KC Pet project cat behaviorist, Jennifer, the cafe seems to have the ideal blend of outgoing and introverted cats- so the social ones help the shy guys with their trust issues. Speaking of kitties, I met most of them that day, but bonded with a few including two gorgeous black cats- Black Panther and his fluffy tail, and Sheena Boneeta, the sweetest little baby with a name that always makes me smile. I also fell in love with Lover Boy, a big ginger lover and Jester, a handsome tabby man with stoic gaze softened by the most luxurious fur ever! My first visit was topped off by a wonderful conversation with Audrey and JT. That connection proved to a great foundation builder because our second visit, a few weeks later, included Jennifer from KC Pet Project, and Molly, owner of soon-to-be-opened Buckminster’s Cat Cafe in Buffalo, NY. 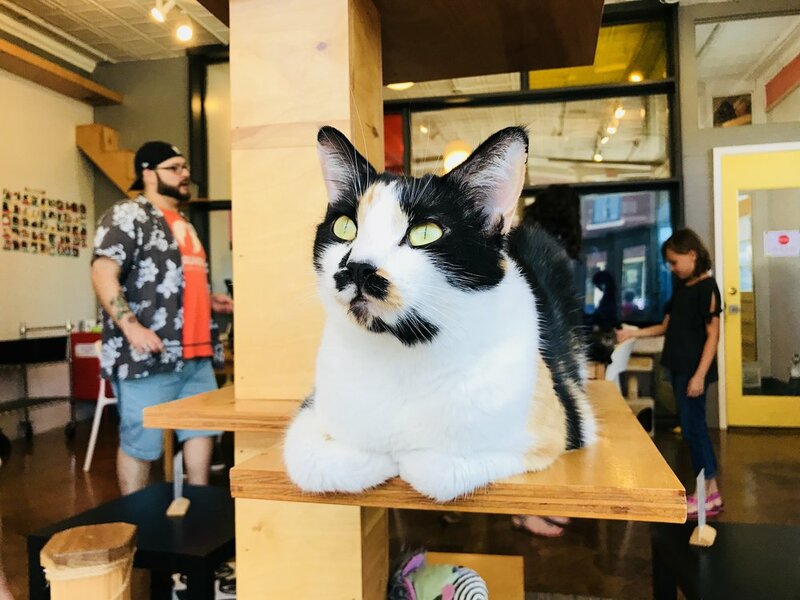 Molly, originally from Kansas City, reached out and asked if I could meet her at the newly opened KC cat cafe for insights she might apply in the opening of Buckminster’s (named after her beloved blue boy). We sat in the cafe space and sipped freshly roasted artisan brew (KC favorite Messenger Coffee) while volleying questions and answers. It was so much fun, I didn’t want to end. Sitting around with people as passionate about cat cafes, rescue and adoption as I am filled me with delight. I had found my people! And that’s how Kansas City went from the place I live to a place that feels like home. Even before I visited, I knew I was going to love Papa’s Cat Cafe. I’ve seen a wide variety of concepts during my travels on the cat cafe circuit, but Papa’s Ernest Hemingway theme especially delighted me. The author (nicknamed Papa) wrote many classics, but his memoir, A Moveable Feast, which recounts his time as a young journalist in 1920’s Paris is one of my favorite books. More importantly, Hemingway was a cat lover and famously kept polydactyl companions at his home in Key West, Florida. A polydactyl has six or more toes on each paw (vs five in the front). Hemingway named his cats after famous people, and the keepers of the Ernest Hemingway Home and Museum (which I have also visited) carry on that tradition today. MacKenzie and Ryan Kennedy are the proprietors of Papa’s Cat Cafe in the central Missouri university town of Columbia. Before opening their cat cafe, both were high-school teachers. MacKenzie will continue to teach while Ryan manages the cafe. There were 17 cats the day of our visit, all provided through a partnership with Boone County Animal Care, the only local rescue group that focuses solely on cats. They are dedicated to helping pets find loving homes while also focusing on TNR (trap, spay/neuter and release) as an effort to reduce the overpopulation of cats and kittens. After we checked in and ordered our coffee and snacks, we entered the cat room and introduced ourselves to Shelby, a former student of MacKenzie’s and friendly cat room attendant. We had such a fun time chatting with Shelby (a self-admitted four time ‘foster fail’, which means she ended up adopting her fosters! ), and we want to recognize her helping us interact with the various kitties and for answering all of our questions. Frankie, Pedro and Corde are the cafe’s full-time residents, with Pedro being a polydactyl in keeping with the Hemingway theme! In addition to the residents, there were 14 adoptable fur babies in the lounge that day, including mischievous ginger AJ, gorgeous tabby Meeka (pictured below luxuriously stretched out on the rug in front of the fireplace) and special sweetheart Mirage, who is blind. The facility is lovely and well-designed. Clean, bright and beautiful, they have nailed the Hemingway vibe perfectly with dark floors, contrasting crisp white walls and accenting tropical pillows plus a palm cat tree. The kitties and the space aren’t the only things to love about Papa’s. The coffee is AMAZING, sourced from Fretboard, a local roaster. Fretboard trained the staff in proper barista technique and it has paid off- patrons sometimes come in just for the coffee. I also ordered Madelienes served with chocolate dipping sauce. Perfection! Papa’s is truly one of those special cat cafes you must visit! With it’s inviting interiors, outstanding coffee, fabulous felines and some of the nicest darn folks you’ll ever met, a visit to Papa’s, much like a Hemingway novel, is an experience to be savored and cherished. A word of warning. If we are friends or relatives, eventually you will be visiting a cat cafe with me. I recently made the trip over the St. Louis from Kansas City. Fun fact: I used to live there and that’s where I met Becca, at work. Becca and I became fast friends over diverse conversations ranging from the politics and travel to sushi and coffee. But mainly, our friendship was forged while bonding over kitties, namely her beloved rescue cats Kevin and Prudence. It had been over two years since I had last seen Becca, but when we landed in KC in July, we made plans to make the four hour drive over to St. Louis. On a warm September Saturday, we met for brunch and a visit to Mauhaus afterwards. It was busy at the cat cafe, with a neighborhood sidewalk sale contributing to the crowds. After a quick browse of the cat paraphernalia, we checked in on the coffee shop side and ordered a latte (Becca) and french press (me), which you can take into the cat room. While waiting for our turn to enter kitty heaven, we stood anxiously in front of the large windows that separate the two spaces. I liked what I saw- the cat lounge is cheerful, bright and very clean. Tables and chairs are grouped together on one side, while the cat trees, benches and large bay windows ring the other. The shelving above the benches frames the guests and creates a fun effect like a life sized shadow box. I love bringing friends to cat cafes, but find the experience simultaneously fun and stressful. While I want to witness their reactions, I’m usually roaming the room taking pictures and interviewing so I end up abandoning my guests completely. Luckily, Becca is a cat pro and figured the whole thing out without my ‘help’. I chatted with cat attendant Clayton, who gave me the lowdown on Mauhaus. 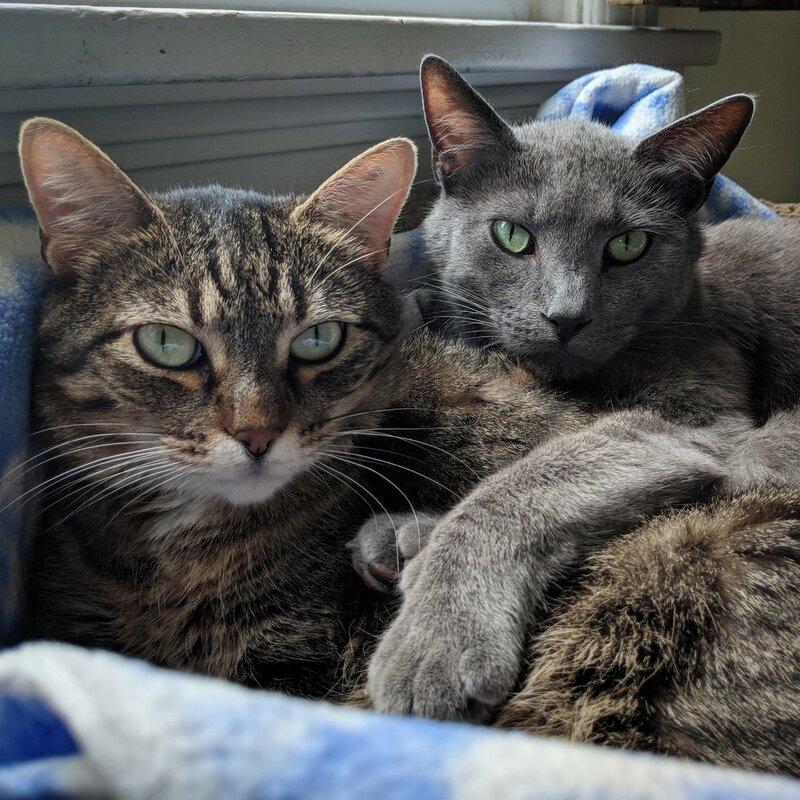 Open two years as of September 2018, they have partnered with shelter Stray Haven to find forever homes for St. Louis’ homeless cats and have been very successful with 149 adoptions to date (210 as of March, 2019). The day of our visit, there were 18 cats in the room, including two residents, Lorelai and Taylor. I met several adoptable cats with memorable names like sassy Lemon Chiffon, sweet Mighty Joe Young and handsome Cortado. Jack, a Kevin dead ringer, engaged Becca in a game of hand biting ‘Chicken’. The room was buzzy with activity, punctuated by occasional admonishments of the children (and myself when I walked away from my coffee! ), but overall the vibe was friendly and lighthearted. 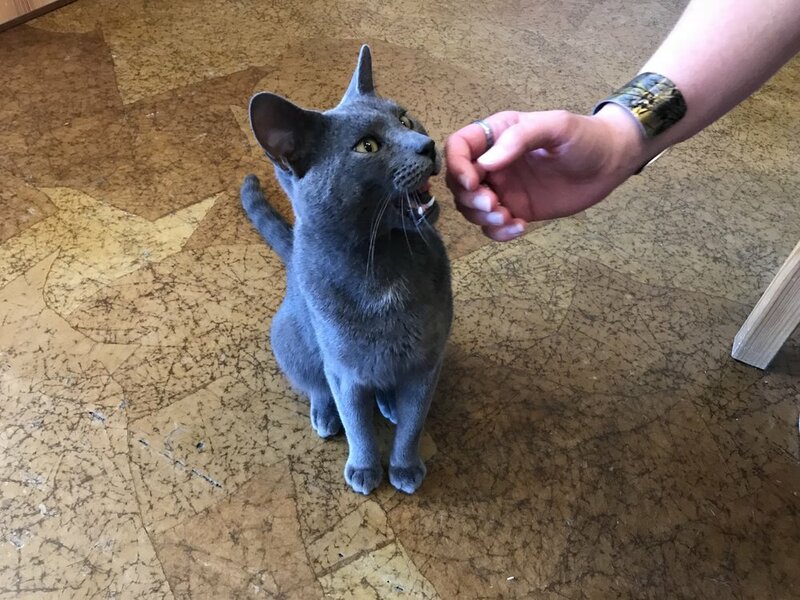 Once I had my fill of cats and coffee, Becca and I headed to the Schlafly brewery down the street for a beer and proper catch up that featured, what else, cats. I never get tired of visiting awesome cat cafes and meeting amazing cat lovers. Sometimes, I get sooo hyped up during these visits that I start talking a mile a minute. Such was the case of our visit to Purr and Suzanne, a volunteer, was the unwitting recipient of my enthusiastic garrulousness. Hopefully, she has forgiven me! You see, it’s kind of hard not to be excited when visiting Purr Catfe, since it’s such a cool experience. A beautiful space with loads of cuddly cats, Purr also happens to be managed by some impressive people. Purr Catfe was opened in 2016 by Lauren Clingenpeel, a ‘certified cat lady’ according to her bio. A 501(c)3 non-profit, the cafe moved to their current location one year ago as of August, 2018. I wasn’t able to meet Lauren that day, but the volunteers indicated she is truly a compassionate individual dedicated to improving the outcomes for cats in NW Arkansas. She also has an equally committed board of directors, comprised of several local leaders. The facility is lovely- bright, cheerful, spacious and spotlessly clean. Considering there were 18 cats in residence that day, the level of cleanliness is amazing, a testament to the devoted and caring staff. I loved how it was so neat and tidy, but with plenty of toys for the cats to play with, and elevated spaces for them to jump, climb and express their natural behavior, including access to a contained outdoor ‘catio’. They have done a great job with the space, demonstrating it was created with cats in mind, but also to be a pleasant place for people, too. The kitties are sourced from several outstanding shelters- Fabulous Felines, Fayetteville Animal Shelter and Springdale Animal Services, which has resulted in an astounding 322 adoptions as of late August (389 as of the end of December). They also have partnered with NWA Community Cat Project, which provides low cost spay and neuter services, training and support for colony care givers, as well as public education on TNR and community cats. NW Arkansas has a very well-organized animal welfare network and these heroes deserve heaps of praise! Despite all the strides this network has made, they still have some incredible rescue stories, including two sweet kitties that were liberated from a 5x8 storage facility in dramatic fashion. They were placed at Purr and quickly adopted into loving homes, so luckily, this story has a happy ending. It was quite a squee fest the day we visited because most of the cats at the cafe were actually kittens! The socialization program at Purr has been highly successful and these adorable babies were quite playful and seemed well-adjusted. I got down on the floor to meet lovable ‘buds’ (as Purr refers to them) Jack, Kyle, Toby and Winston, but became completely enamored with precious ginger, Rudy and his expressive eyes. I also felt my heartstrings tug when I met Mystic, a shy, yet affectionate (he couldn’t get enough head rubs!) boy that preferred the safety of the back room to the wide-open spaces out front. There were so many fabulous felines to meet and photograph, that between that and talking Suzanne’s ear off (she’s as patient as a saint! ), two hours just flew by. Yes, we spent two hours there, and honestly, could have stayed much longer if we hadn’t had a 3.5 hour drive back to Kansas City. All of this unlimited awesomeness costs just $8 and you can also enjoy unlimited coffee and tea for an additional $2. I hope that you make time to visit Purr so that you can not only get some quality ‘purr therapy’, but help support the outstanding work they are doing. The Neighbor’s Cat is the alter ego of Paula LaBine, an itinerant cat lover who writes about cat cafes, rescue/adoption & TNR, and has been featured in Miau Magazine, Katzenworld Blog, The Catnip Times and Taiwan Scene. She is currently on a quest to visit every cat café in the world, 210 in 29 countries so far! Find her at theneighborscat.com or on Instagram/ Facebook/Twitter @catcafeviews.